Little Talbot is an unspoiled barrier island containing over 8 km (5 miles) of wide sandy beaches, dunes, and a maze of salt marshes and tidal creeks. Behind the dunes are ancient live oaks in a splendid coastal hardwood hammock. Otters, Raccoons, Marsh Rabbits, and a variety of shorebirds inhabit the salt marshes and fiddler crabs are common. Loggerhead sea turtles nest along the beach in summer. 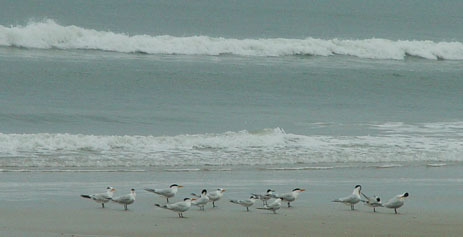 Nearly 200 species of birds have been recorded from the park, including Caspian Terns, Royal Terns, and common loons. The observation deck at the south end of the park is a good place to watch for gannets and sea ducks, and armadillos are often seen foraging beside the road through the park. In summer you can rent canoes and bicycles to explore the island. Huguenot Memorial City Park is an excellent winter birding spot a few miles south of Little Talbot State Park. Inside the park, follow the road towards the ocean as far as possible. To the south you will see the impressive silhouettes of the huge US Navy ships across the river at Mayport. Thousands of gulls, terns, and skimmers rest on the northern tip of the long spit of sand that juts out into the river. Dunlin, willet, ruddy turnstone sanderlings and American Oystercatchers congregate at the lagoon. While you are in the area, a side trip to the nearby Kingsley Plantation House is highly recommended.